This year will be the hottest on record and 2016 could be hotter due to the El Nino weather pattern, the World Meteorological Organization says. This year will be the hottest on record and 2016 could be hotter due to the El Nino weather pattern, the World Meteorological Organization said on Wednesday, warning inaction on climate change could see temperatures rise by 6 degrees Celsius or more. But decisions taken at a summit of world leaders in Paris starting on Monday could keep global temperature rises within 2 degrees Celsius (3.6 Fahrenheit) over pre-industrial times, a target set down in 2010 to try to prevent dangerous climate change. director-general Michel Jarraud told a news conference. "You have scenarios assuming very strong decisions, very quick and sharp reduction of greenhouse gases, and you have other scenarios with business as usual, where you end up with predictions of additional warming of 5, 6 degrees, maybe even more. That will very much depend on the decisions (in Paris)." milestone" of 1C above the pre-industrial era. "This is due to a combination of a strong El Nino and human-induced global warming," the WMO said in a statement. Jarraud said El Nino may be responsible for 16-20 per cent of the rise and longer-term averages showed temperatures were rising regardless of El Nino or its cooling counterpart La Nina. El Nino, a naturally occuring weather pattern marked by warming sea-surface temperatures in the Pacific Ocean, causes extremes such as scorching weather, droughts and flooding around the world. Meteorologists expect El Nino to peak between October and January and to be one of the strongest on record. 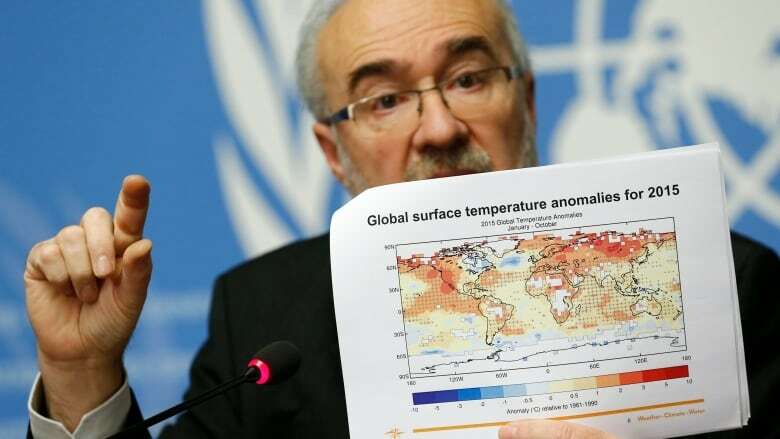 A preliminary estimate based on data from January to October showed the global average surface temperature for 2015 was around 0.73 C above the 1961-1990 average of 14 C and around 1 C above the pre-industrial 1880-1899 period, the WMO said. "This is all bad news for the planet," Jarraud said. The years 2011-2015 have been the hottest five-year period on record, with temperatures about 0.57C (1.01 Fahrenheit) above the 1961-1990 reference period. United States, Australia, Europe, South America and Russia — broke temperature records by large margins. "The world's ten warmest years have all occurred since 1998, with eight of them being since 2005," the WMO said. Next year may be even warmer — levels of greenhouse gases in the atmosphere have risen to a new record every year for the past 30 years and El Nino is likely to continue into 2016. "The year whose annual mean temperature is likely to be most strongly influenced by the current El Nino is 2016 rather than 2015," the WMO said.